* Senior club appearances and goals counted for the domestic league only and correct as of 30 March 2018. Lionel Andrés "Leo" Messi Cuccittini (Spanish pronunciation: [ljoˈnel anˈdɾes ˈmesi]) (born 24 June 1987) is an Argentine footballer. He plays for Barcelona and the Argentina national team as a forward. He also has Spanish citizenship, meaning he can play for Spain. 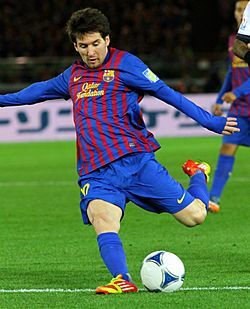 Messi is widely considered by many experts and critics as one of the best football players of all time. Messi has 5 Ballon d'Or awards. Messi was awarded FIFA World Player of the Year in 2009. His playing style and skills are very similar to the Argentine legend Diego Maradona. There is much competition between him and Portuguese footballer Cristiano Ronaldo because of their similar skill levels. 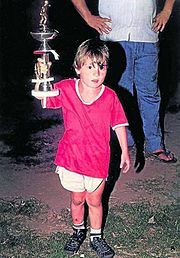 Messi was born in Rosario, Argentina to Jorge Messi and Celia Cuccittini. 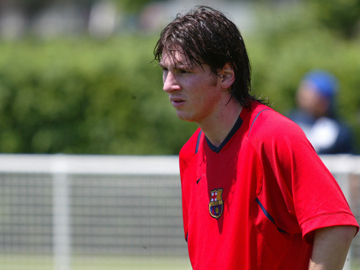 Messi began football at a young age and his potential was quickly seen by Barcelona. He left Newell's Old Boys' youth team in 2000 and moved with his family to Europe for Barcelona. They moved to Spain because Barcelona offered treatment for his growth hormone deficiency. He started in the 2004–05 season, and he scored his first goal on 1 May 2005 against Albacete from an assist by Ronaldinho. The goal made him a the youngest-ever scorer for the club at that time. Barcelona won La Liga that season for the first time in 6 years, and won the league for a second time in a row along with the Spanish Super Cup and UEFA Champions League in 2006. His first very good season was in the 2006–07 season; he became a first team regular, by scoring a hat-trick in El Clásico. He scored 14 goals in 26 league games. Maybe his most successful season was the 2008–09 season. In this season, Messi scored 38 goals. 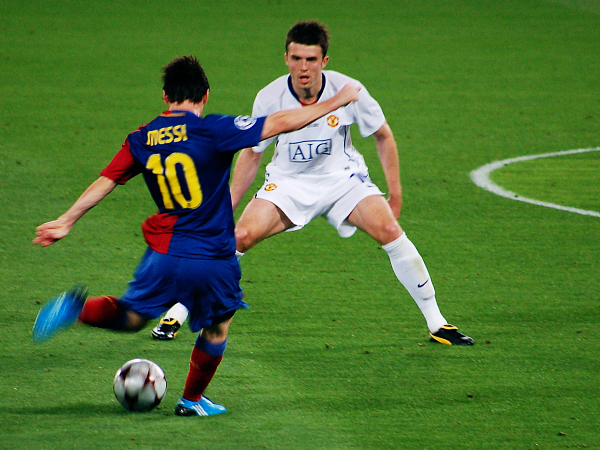 In the following 2009–10 season, Messi scored 47 goals in all games. That equals to Ronaldo's (Brazilian) record total for Barcelona. Messi decided to play for his homeland, Argentina, in 2005. He led the team to the final game of the 2005 U-20 World Cup against Nigeria, which ended in a 2–1 Argentine victory. Messi scored two penalties as his national team won the U-20 World Cup. In addition to the gold medal, Messi was awarded with the Golden Shoe for most goals scored (6), and Golden Ball for best player. Messi was made captain of the national team in 2011. On 26 June, Argentina once again lost to Chile on penalties in the Copa América Centenario after a 0–0 tie. Messi missed his penalty in the penalty shootout. This was Messi's third consecutive defeat in a major tournament final with Argentina, and his fourth overall. A day after the match, Messi announced his retirement from international football. Messi has three children with his wife Antonella Roccuzzo. They are named Thiago Messi, Mateo Messi and Ciro Messi. Thiago was born on 2 November 2012, Mateo was born on 11 September 2015 and Ciro was born on 10 March 2018. On the bottom of Messi's cleats is the name or his first son, Thiago. Messi and Antonella married in June 2017. When not playing on the field Messi finds time to do charity work. He started the Leo Messi Foundation in 2007 which helps children in at-risk situations. Messi also opened a kids park for children living in the hospital at the University hospital Vall d’hebron in Barcelona. Messi accepting Golden Ball award, alongside his future teammate Neymar after the 2011 FIFA Club World Cup Final. Lionel Messi Facts for Kids. Kiddle Encyclopedia.